Tape recordings are an amazing thing. Someone hit the ‘record’ button at random, and at times, such as this, we get to hear something quite amazing. That this tape survived all these years is amazing in and of itself! Recorded just about a month after the launch of Top 40 WRKO from the ashes of sleepy WNAC, here’s Chuck “Chuckles” Knapp, heard doing an ultra high-energy show! Now, everyone knows that WRKO was a Drake/Chenault consulted radio station, you’ve all heard the Johnny Mann Singers short jingles. Now listen to this! WRKO did not begin its Top 40 life as a Drake station. The familiar “Boss Radio” sound heard at KHJ and KFRC is not present in this recording. The jingles are even a different melody and certainly NOT what we were accustomed to in the late 60s and 70s. There’s even a hint of WABC-style reverb on the signal, and Drake NEVER used reverb at any of his consulted radio stations! These facts come together to make this a very unique recording, since we know the Drake sound came about in September 1967, so this is from a very short window in time when WRKO had first come into being but before the familiar Bill Drake sound took hold. Enjoy it here. And, not to leave anyone out, I’d like to point our visitors to WRKO.ORG, the tribute website to The Big 68 which has been a labor of love for Shel Swartz for many years. Not sure if She still runs the site, but it is still up and has been re-designed recently. Go enjoy the goodies there, then return here to Airchexx.com as we bring you more of the greatest radio of all-time! I have this aircheck in better fidelity, with no hiss, but a great post anyway! This is from August 5th, a Saturday nioht, and the Fabulous thunderbirds are appearing at Otis Air Force base on the 12th of THIS month. There is only one 12th on a Saturday night, so August it is. I remember this quite well! Before Bill Drake took over WRKO during the summer of ’67, WRKO had a very nice and solid Top-40 sound with just the right amount of reverb and good amount of oldies mixed into the music of the day. I loved the jingles and the unique personality of the jocks. I preferred the sound of early WRKO compared what Bill Drake morphed the station into. 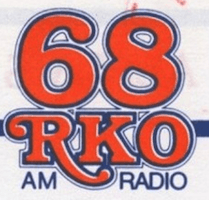 The nice thing also was WRKO was 50/50 simulcast on WRKO-FM (98.5) complete with the reverb and HI-FI audio. Both WRKO and WRKO-FM (“R-KO-matic”) were a great combo!